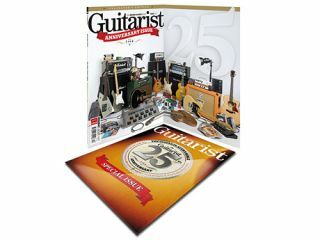 Guitarist magazine celebrates its 25th Anniversary this issue with a special Collector's Edition, on sale now. The myriad applications for Apple's wonder gizmo include interactive chord dictionaries, guitar tuners and much, much more. With an integrated iPod it'll even play mp3s for your backing tracks too. The New Jersey quintet shot into the stratosphere back in August 1986 with this album. Two chest-thumping anthems, a tear-jerking ballad and a ditty about steel horses helped Bon Jovi bring rock back to the masses. Richie Sambora rebirthed the talk box and went pinch-harmonic potty. Thanks largely to the phenomenally successful single Jump, this is Van Halen's most commercially successful outing. Another highlight is Sir Ed's inventive use of the obscure Kramer Ripley Stereo guitar on Top Jimmy. Founded by Michel Doidic and Marcus Ryle in 1996, Line 6 became the leader in digital amp modelling, revolutionising the whole amp world. This 2 x 12 combo, reviewed in December 1996, was the genre's first serious commercial offering. It sounded good by 1996 standards, but the front panel and menus were utterly baffling. Valve purists remain unmoved, but the jack-of-all-trades convenience of DM amps is the more compelling argument - the sales figures speak for themselves. to like about that, eh? This unassuming four-mode tube preamp was the shortcut to obtaining the whole world of Marshall tones past and present. All three Iron Maiden guitarists still use the unit as the core of their sounds, as has the Guitarist CD on occasion. Following the vintage-derived Japanese Squiers of 1982, 1985's Standard emerged with an updated feature set, soon becoming the first affordable yet quality step on the ladder of classic guitar veneration for countless players. Word gets around when a new hot-shot hits the streets, and the arrival of the Swedish neo-classicist and his jaw-dropping 1984 debut Rising Force caused those who place technique above all else to finally find their Messiah. "Trying to determine who picks more notes per second is ridiculous," he said. "What is important is the quality of the music." Tell it to the hand, dude. They were around in 1982, but the CD didn't arrive properly until 1985, when Brothers In Arms went platinum. It hasn't looked back - with improved durability, sound quality and convenience, it became a true universal medium - even in the face of MiniDiscs, DVDs and mp3s. But will it survive another 25 years? For the full list, see Guitarist issue 323, December 2009. On sale now!